As I write this, it's our last night in Cozumel. Soft sands, gorgeous skies. The friendliest fish this side of the Caribbean - a diver's paradise. As I sit here, the cool evening breeze is taking just enough edge off of the heat of the day to make it blissfully comfortable. Tomorrow we travel home. In the space of twelve hours, the temperature we experience will drop by over sixty degrees celsius. Eeep. But that's okay. Why? I'm going home. To Edmonton. YEG as many of you know it. Where the heart is. And I love it. My love affair with Edmonton started as any other would. As a kid coming from a small town I was infatuated by the possibilities of the 'big city.' It grew on me. Close enough to my parents to have ready support. Far enough to enjoy independence. And in the last couple years, I have really started to make fascinating, valuable connections with amazing people. Driven people. People of vision. Of passion. People who resolutely call Edmonton home and cherish it for the rich community that makes up its heart. This image was passed around 'the internets' a month or so ago. Many people shared it, commenting on how funny but true it was. Chuckling. LOL-ing. 'Liking' it and Tweeting it. People found it quite entertaining. I didn't laugh when I saw it. I felt quite different indeed. A lump in my stomach. A sense of defeat. A hopeless psychic shrug. It doesn't matter how many fascinating people I meet. How many great plans and initiatives are started. How much drive and ambition we have. This is how we are known. Worse, this was mostly shared by Edmontonians. This is how we see ourselves. 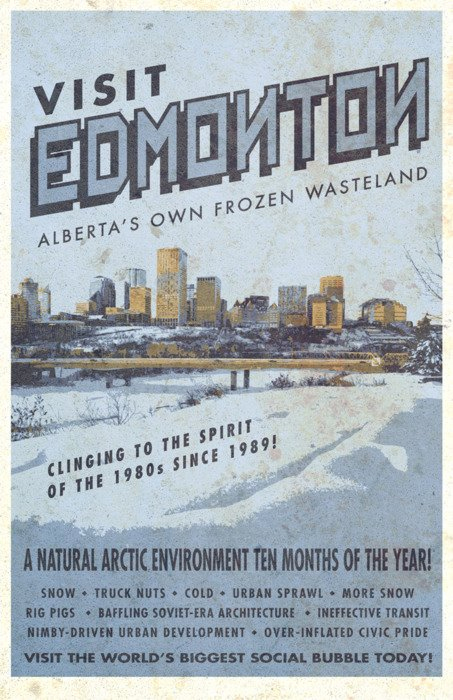 I've written about Edmonton's branding problem before. I am far from the only one. Todd Babiak has written and spoken about it as well. All these vibrant people. All these fantastic ideas. StartUp Edmonton, ArtScene, #YEGalleyburger, Festival City, some of the best damn recycling programs in the world, WhatTheTruck, a river valley that is the largest stretch of urban parkland in North America, an IT and media community that is collaborative instead of competitive, an incredibly talented film community, more theatre per capita than anywhere else in North America. And the poster above is how we see ourselves. That's what resonates with people. That's what gets shared on Facebook. That's what we identify with. I stared at my computer in stunned silence for a while. I considered moving. I have the belief that Edmonton can become a vibrant place that is world renowned - for tangible reasons, not for the crap that usually comes raining down on us from the mouths of politicians pushing agenda. That belief went out like a candle in a rainstorm. Work that I had already been postponing sat on my desk with no hope of catching my interest ever again. This was it. This was our 'brand.' This was who we are. This was everything we didn't want to be. I stared. I listened to the radiators creak. The sun went behind a cloud and my office seemed colder. Everything we didn't want to be. Here's a checklist of all the problems with our image. Our identity. Neatly laid out. And there were two ways to look at it: something to be depressed about, or something to inform change. We can't come up with an identity on a piece of paper and then follow it. No city can. We have no choice but to find ourselves - new-agey as that might sound. But that doesn't mean we have to do it without guidance. I looked at the poster in a new light. This is it. This is the Edmonton that we don't want. Much as businesses look at their vision statement to decide what actions will drive the company toward their goals, we can look at this to make decisions that will drive us away from what we don't want to be. What we cannot afford to believe in. An image of Edmonton that we ourselves mock mercilessly. I started to smile. Whoever designed this little poster perfectly encapsulated what we want to steer away from. I thought about it. Why was there so much resistance to the plans for the new museum? Because it will look exactly like the pedestrian outdated buildings that this poster mocks. Sure, there was resistance to the new Art Gallery too, but there is resistance to everything. Ask any politician. The question becomes, what resistance is worth putting up with? What battles do you fight, what hills do you die on to make the world a better place than it was when you got there. How many people do you hear still complaining about the AGA vs the number of people who speak positively about it? Why was there so much furor over the airport development? It was a mix of this same resistance to change, plus a generous heap of hope that what will come out of it steers us away from the idea in this poster. We're not sure who we want to be when we grow up. We're still young, in the scope of the world. But we certainly know who we don't want to be. So here's your mission, should you choose to accept it. Save that poster on your computer. Hell, print it out. Just put it somewhere where you can see it every couple of days. Look at it. Learn it. And if you ever make any decision or choice that has even the remotest chance of affecting Edmonton, steer as brightly and boldly away from the idea in that poster as you can. The trap is not choosing. The trap is safe decisions and non-decisions. (Capital Ex anyone?) The sides of the trap are laced with the belief that others will decide and that there is nothing you can do. The bottom of the trap is flooded with complacency and inertia. This is not just about what councillor you vote for or being on your condo board. This is about a philosophy, a belief, that we can be more than "Alberta's own frozen wasteland" and it is a belief you need to embrace deeply, and to act on. In every way you can. The opportunities may be few or frequent, but there is nothing more powerful than an idea. And once that idea catches on, we can make Edmonton the city that it is capable of being. Tonight I leave Cozumel - home of the friendliest fish this side of the Caribbean, the diver's paradise. Tomorrow I return to Edmonton. What am I coming home to? It is not the world's biggest social bubble. But changing that idea is up to all of us. We can shed the shackles of the 'cards we're dealt' and start making new rules to the game. We can be the captains of our destiny, without having to be rich enough to own a hockey team. Let's make it our mission that some day, soon, people will look at this poster and say "Really? 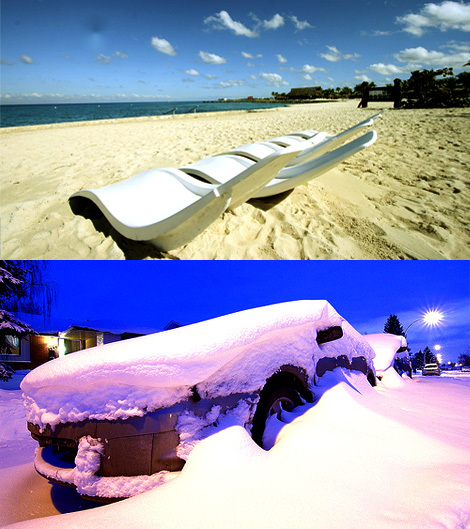 Edmonton used to be like that?" Let's make this image, this negative idea, a thing of the past. Update: Here's the original source of the poster, and the artist who created it - check out his excellent portfolio. Thanks to âyiman for the clarification. Great epideictic for those of us who see Edmonton for what it CAN be instead of lamenting what it's STUCK WITH. Pessimism is rather lazy. The image of my home as portrayed by that poster is what I fight everyday. I'm in, friend! With all that I am! As someone who just CHOSE to move back to Edmonton - I get asked everyday about why. I want to make Edmonton a place that people don't say "why did you move here?" but "of course you moved here - welcome!" Awesome post, man! I agree with everything you're feeling, and count me in! I've been battling this for years! I love your passion and your commitment to Edmonton. As an "accidental" transplant to Edmonton (the things we do for love! ), I have a much more ambiguous relationship with the city. Mostly, it frustrates me. Yes, I have come to realize that there are absolutely wonderful things about Edmonton (EPL, cool people, the Uni, the summer). But I just cannot come to love the city itself. After having lived in Vancouver for a decade, Ottawa for five years, and three different cities in Germany for a year each time, I have come to believe in the power of good urban planning. Right now, we are living in Freiburg, Germany and there are as many kms of bike and walking paths as there are roads. We live on the edge of the city, but I can hop on the tram (2 min walk there) and be in downtown in 12 minutes. There are 12 playgrounds within a 1 km radius of our apartment. All of these things make my life good on a daily basis. They make my kid's life good on a daily basis. They have made us lose weight. I could go on. In Edmonton, we have struggled to find a place to live that gives us this quality of life. It is hard, man. Really hard. We want to lead lives with limited car use. We want to walk and bike to work and to school and to grocery stores. We want to live in an apartment, close to the centre of the city. Where we live isn't bad, but I almost get run over every day on my way to work. There is no chance that I will let my son do this on his own. So I have this fundamental conflict with Edmonton that I can't seem to find the solution to. I know that I'm not the only one to complain about these things and I know that there are changes coming (like the airport redevelopment), but I don't have your history or connection to Edmonton. So I'm not totally motivated to stick around for 20 years to see these changes happen. It's a conundrum. I should add that we want to look for a 3 bedroom place when we return (I need an office). I'm dreading it. If anyone knows of a good building/townhouse complex in downtown, Old Strathcona or near the south LTR stations, I'd be happy to hear about it. Edmonton is not without its failings. I'm certainly not about glossing over those. What I think this poster allows us to do though, is to take a more informed approach towards the viable, positive evolution of our city. It's like a negative creative brief. Here's where we are. Here's where we want to steer away from. I don't think that we can start by saying what Edmonton should be. With over a million people in the Greater Edmonton Area, there's just too many valid opinions. But when you see, clearly laid out, what isn't working, then you have a chance to take steps to improve it. I think that since this poster already resonates with Edmontonians, we can use it as a common starting point. And as has been evidenced by debates over the airport lands and the arena, a bit of common ground is a damn rare thing. The thing that bothers me is that poster comes nowhere near describing my home. Faults here for sure (like all cities) and lots to work towards but that's not my city now. And I'll keep telling people as long as I have to until our self confidence issue is improved. Hey Doug, that's totally it. Until we're positive with ourselves, no one is going to be positive about us. It's Self-Esteem 101. I'm late to the party, but here's my two cents. There is a plan afoot, led by consultants and civic administrators, to ceaselessly remind Edmontonians of the supposedly backward, provincial place that Edmonton used to be. This is a convenient fib, designed to justify "civic transformation". What is civic transporfostion? It's spending taxpayer money on hockey arenas and downtown Icd Districts. It's building a LRT system to benefit developers. It's about hiring self-proclaimed communication mavens to monitor and respond to useless social media platforms. It's about raising your taxes and celebrating, almost in an Orwellian way, urbanism as the city spreads ever outwards. Yes, this is the new Edmonton. This is transformation. Who benefits? Professional boosters, charlatans, the super wealthy, the cultural elite. Who loses out? Virtually everyone else. Edmontonians - I urge you to remove the scales from your eyes and see your city as it is, not as others would have you see it. You don't need civic transformation; the Edmonton of old - built by blue collar, industrious citizens - formed a solid bedrock.